Fat Cat is a cafe-style gastropub in Bow Wharf, just south of Victoria Park. My brother and I arrived after 3pm on a Saturday for a very late lunch. We were pleased to learn they were still serving food and they had a high-chair available for my brother’s baby boy. This venue is part of a national chain, but it’s the only one in London. It has the unusual distinction of feeling both spacious and cosy at the same time. The dark tones, warm lighting and comfortable chairs help create this effect. The floor is split into two. There is a bar area and a slightly raised restaurant section where we claimed our table of choice. We ordered pints of Guinness and Strongbow and assessed the menu. There is a wide range of sandwiches and typical pub meals. Burgers would appear to be their speciality, so we opted for a bacon and cheese burger and the Italian burger (with mozzarella, pesto and rocket). They arrived in about ten minutes, laden with their toppings and accompanied by large chips and coleslaw. The meals went down well with us both. The burgers were thick and rich of taste. They both came medium/well done. We weren’t offered an option on this, but nor had we asked. The chips were as hearty and wholesome as chips can be. We had also ordered a pot of peppercorn sauce which proved a great accompaniment. The service was friendly and appropriate. Our waiter didn’t trouble us unnecessarily but was quick to catch our eye when we needed him. Fat Cat has a relaxed, family-friendly atmosphere; perfect for whiling away a cold afternoon. I’ve been before for brunch, another experience I’d recommend. There are several long-standing offers. Ladies should visit on Thursday evenings for a good deal and students enjoy a 20% drinks discount at all times. Our bill came to £28.25 excluding service. 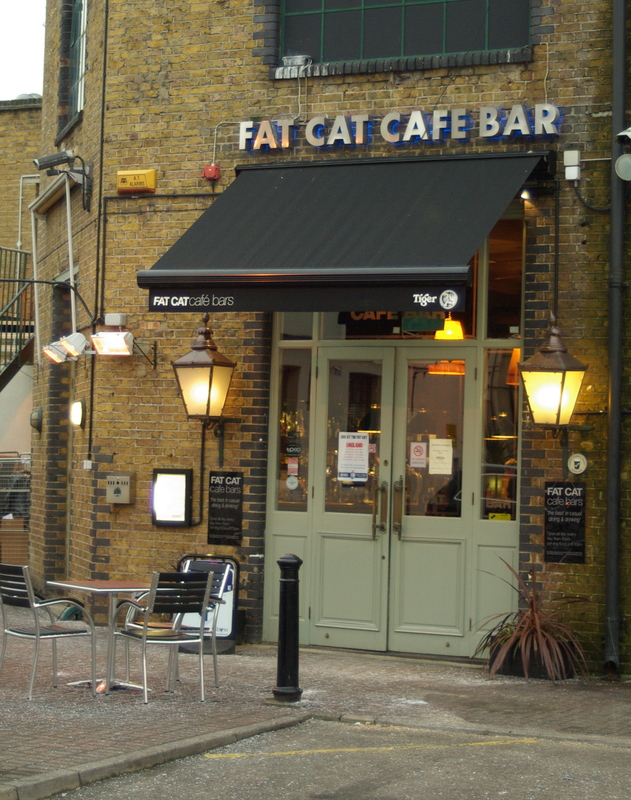 Fat Cat is a 10-15 minute walk from Mile End or Bethnal Green stations. It’s served by a number of bus routes and there is also a free car park. Fat Cat is at Bow Wharf, Grove Road E3 5SN. Telephone: 8983 4353. My Thirst Mate and I wanted to mark a special occasion, so I called ahead to be sure of a Friday evening table booking. I suggested 8pm, but 7pm was recommended if we wanted to eat before the DJ cranked up his kit. I appreciated the advice. The Mayan King, in Victoria Park Village, describes itself as a cocktail tapas bar. It takes its wine quite seriously too. The furnishings can only be described as eclectic – no two tables or chairs appear to be the same. The theme is evident on the walls; I could imagine some of the decorations in ancient Mayan homes. Some of the plasterwork appears unfinished, but this merely completes ‘the look’. We arrived at the allotted time and were taken to a small table towards the back. We were offered tap water immediately; a nice touch in an area where they could probably add spring water to the bill if they dared. Our server, friendly and attentive throughout, recommended two cocktails for us to enjoy whilst browsing the food menu. As we selected our tapas, it became clear most of the menu was unavailable. There were just four options to choose from. So, with a little frustration, we selected them all. Our server asked if we would like wine with our food and I asked for two glasses of red. Instead he recommended a Riesling. It was a great complement to our food, but a little pricey at £7 a glass and unusual to be offered a white upon asking for red! The food came gradually over a period of 20 minutes or so. Tortilla chips were brought to accompany our dishes. Minilla is a crab based mixture (a stir fry, perhaps?) with crab, red onion, tomatoes, jalapenos, olives and raisins; tasty but plainer than I expected. Ceviche was a real treat and one we wouldn’t have chosen from the full menu. It’s finely cut cod in lemon juice, red onion and chipotle chiles. Each bite came a satisfying punch. It’s worth going in just for this dish. Finally we were brought quesidillas along with humous & pitta to enjoy with the last of our wine. Our bill came to £48.50 excluding service.